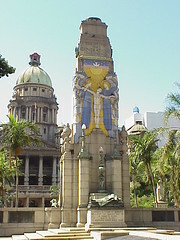 The War Memorial in Gardiner Street, Durban came about through an archtectural competition in 1921. The Cape Town firm of Eagle, Pilkington and McQueen won and the resulting structure was completed in 1926. The most striking feature of the Cenotaph is the colourful sculpture of the fallen warrior being transported to heaven in the arms of two angels. Heaven in this case represented by an amazing yellow sunburst topped with a white dove and a starry sky. 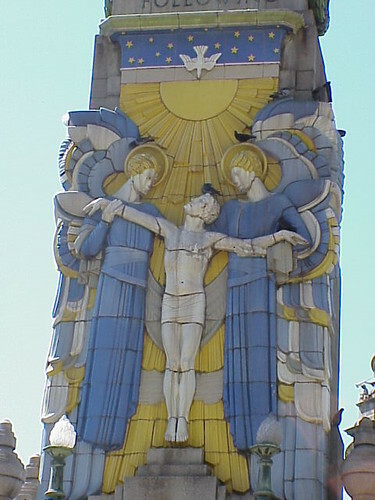 The sculpture was completed by Harold and Phoebe Stabler of the Poole Pottery in England and shipped out to be assembled on-site. It is a bit disconcerting to see such bright colours on a war memorial but the representations are so well done that respect is duely paid to the fallen regardless of the colours. I grew up in Durban, which has a few Art Deco buildings and always loved the cenotaph. It's really striking in the hot sunshine. Durban has some great Art Deco buildings. Broadwindsor, Hollywood Court, Surrey Mansions and the Grey St area to name just a few and the colours on the cenotaph are, as you say, striking.